I had hoped to make this with ingredients from our cupboard, but quickly discovered that we had no shaving foam: an essential ingredient! No surprise really given the size of my husband’s beard! A quick click, and I had some added to my shopping basket ready for our next messy play sensory adventure. I couldn’t decide when to add the food colouring, but in the end it didn’t matter as you will play with it for so long, the colour will disperse eventually. 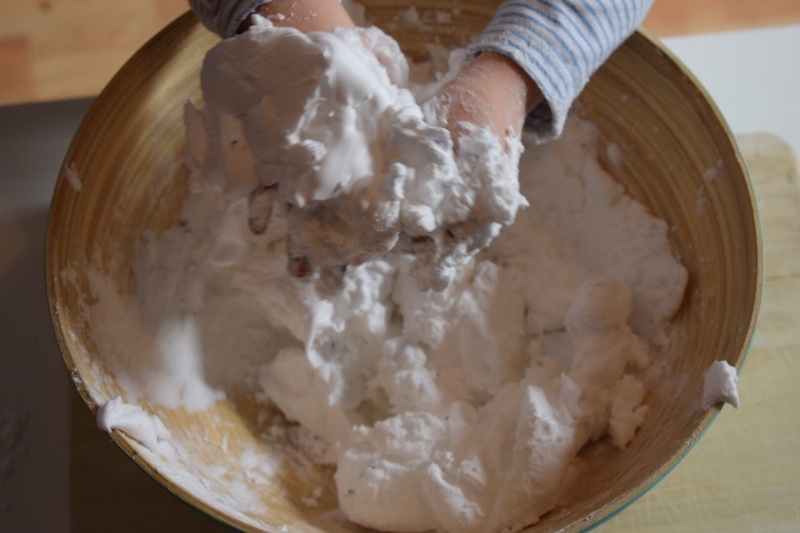 I added equal parts cornflour and shaving foam to a big bowl. 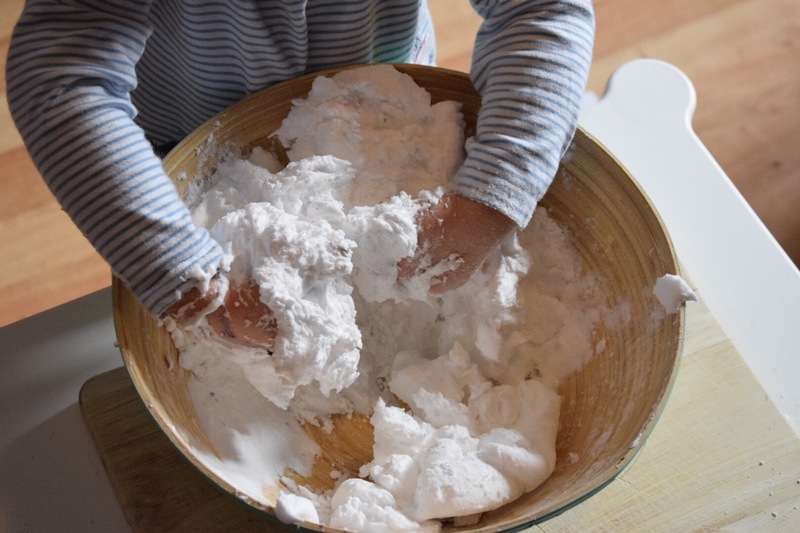 A large bowl, tray or tub is a must for this stage – the combination of fluffy shaving cream and powdery cornflour means you need plenty of room to try and mix it. Imagine trying to mix icing sugar with butter in a small bowl … carnage! I placed the large bowl on a low table as Boo always helps to make our activities. She loves the mixing stage just as much as playing with the finished product. I also think it’s great early scientific learning discovering what happens when you mix different substances. This takes some work to combine but the sensation is lovely as the 2 textures are such contrasts. For this recipe, it is key that you don’t add all of your ingredients at once. Hold some back. 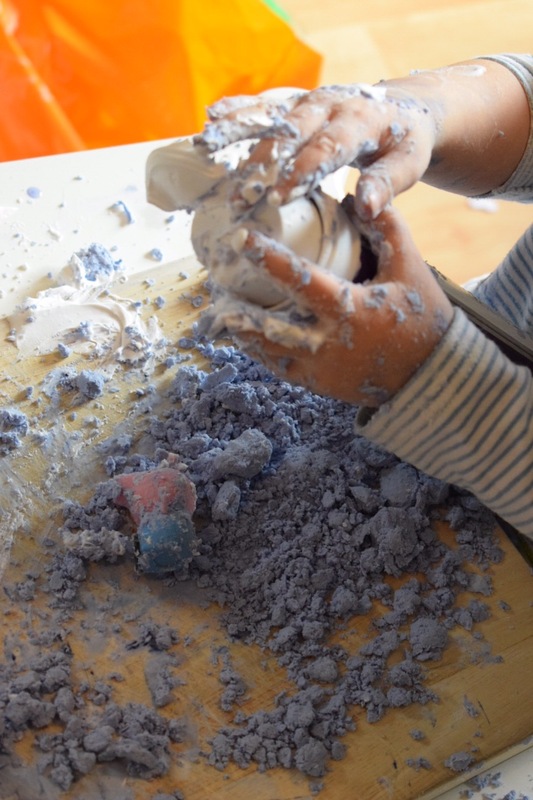 Unlike the scented putty we made, I found it a little more tricky to get the texture just right. Too much shaving cream and it is rather sticky. Neither Boo or I liked having it stuck to us – it was like being covered in cake batter and not being allowed to lick my fingers! Don’t worry if this happens to you, it is really easy to fix. 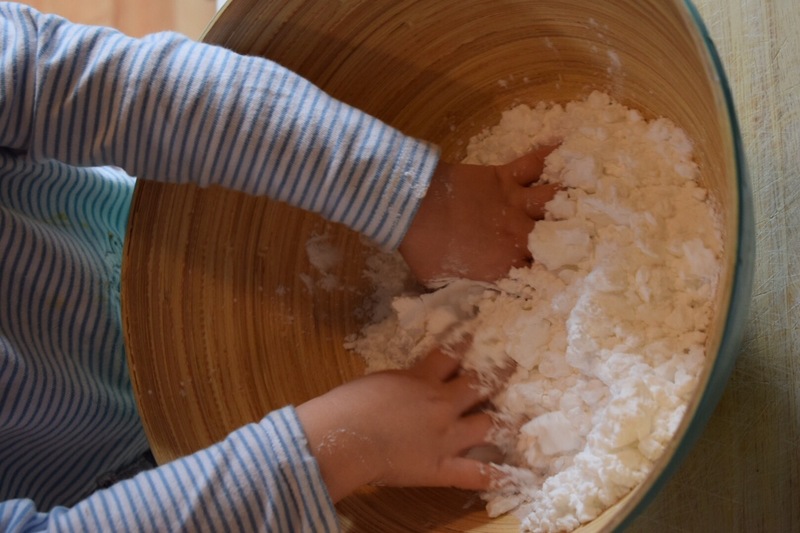 Add a little more cornflour and as you mix it in, it develops a texture more like cloud dough or moon sand. It will naturally fall off your hands and you will be able to play! The trouble we had was getting it to a texture that was moldable. I had hoped to be able to use some of our play dough cutters and shapers to make shapes and characters. As you add more cornflour, it becomes crumbly and doesn’t hold very well. Eventually, after lots of little adjustments, I managed to get it just right. A lovely dough that could be molded into fun shapes, while still being crumbly when squished. 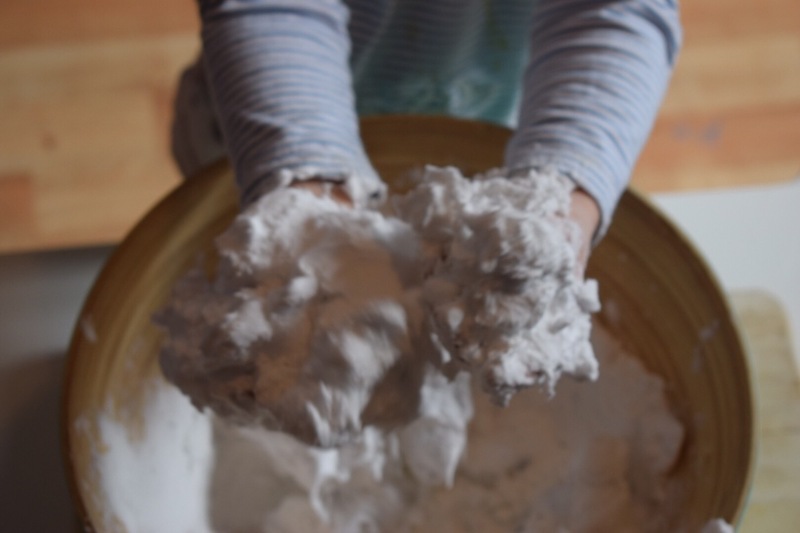 When you mould the dough, it has a soft foamy texture. As you squeeze it apart it will crumble apart again like soft sand. It really is very therapeutic running it through your hands. This will keep for a long time in a sealed container. Sadly, I turned my back for too long and Boo added our floam beads and a whole jar of cinnamon to the pot! I’m not too cross at her experimentation but it does mean I won’t be keeping this batch. Looks like we will have to find something else to make! * I’ve just seen other photos of foam dough and realised our batch wasn’t quite right. I’m not a Pinterest Mum. 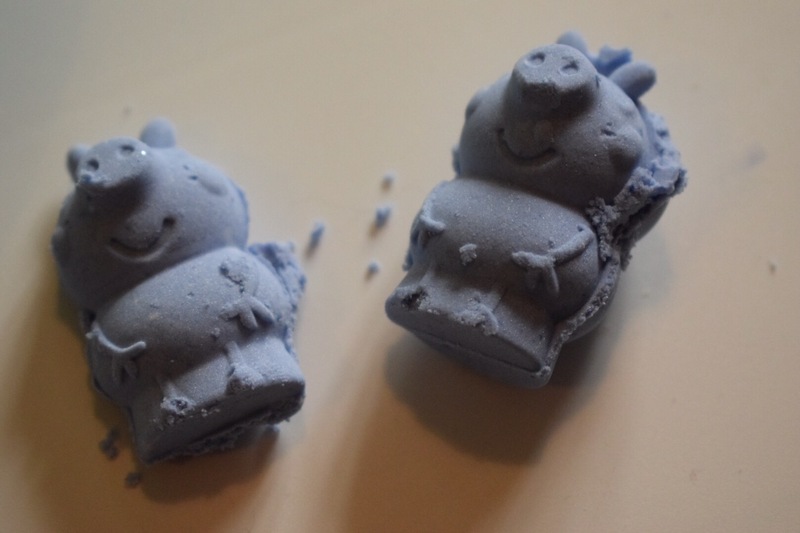 I don’t care that it wasn’t quite as soft and as moldable as it could be. We enjoyed it and that is what counts. Previous I am in a bad mood. Next I used to think I was so smart.